Shortly after OHSU Knight Cancer Institute debuted their new advertising campaign ONEDOWN, stating that CML was Cured, those of us living with CML began such a ruckus that OHSU revised their advertising campaign's wording from "Cured" to "R.I.P. CML" to “Lethal Becomes Nonlethal," in an attempt to find the correct words to fuel their campaign, without offending those of us, currently living with CML.I am still, however, perturbed by the whole "ONEDOWN" wording campaign. 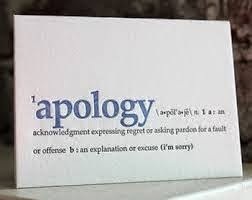 They also issued an apology. I truly believe that this faux pas was likely devised by an advertising company, in an attempt to utilize the success of Gleevec, which does manage CML and give us all a new lease in life, to raise money in order to do the same for other cancers; I do not believe that it was ever intended to disrespect or make light of those of us living with CML. As a person living with CML for three- plus years, I am truly grateful and ever indebted to the research that OHSU Knight Cancer Center has done, developing the drug that will hopefully allow me to live long enough, to actually see a “cure” for CML; to someday allow me to ring the bell. I believe that the view of a person living with CML and the view of researchers and oncologists differ greatly. I also believe that in a perfect world, we would all walk in each other’s’ shoes. I understand that in order to continue to search for “cures,” money needs to be raised; and what greater way to raise money than to share stories of success. I applaud OHSU’s dedication and efforts in forging forward in their attempt to eradicate cancers, one by one. 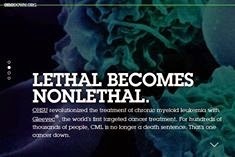 I am not certain that “Lethal Becomes Nonlethal” is the appropriate slogan for what they are attempting to portray, but it is definitely better than “CML Cured”. I almost think that “R.I.P. CML” is more appropriate since that really IS what Gleevec does; it stops CML from multiplying to the point of causing death. We all actually still “have” CML, and our TKI’s are managing it. We all hope and pray that every PCR test we take will show that our BCR-Abl is under control and is continuing to“Rest in Peace." In my opinion, a focus group that works closely with an advertising company, when dealing with sensitive subject matter, can save all persons involved, a whole lot of heartache and a whole lot of money! "Words can provide hope and inspire people to action. They can also evoke powerful emotions. In launching a campaign to raise funds for cancer research, we saw a message of hope and a rallying cry to spark engagement from people. Some in the CML community—a community we consider of vital importance to our efforts—disagreed. We've heard from CML patients who feel the word ‘cure’ used in the campaign takes focus off the challenges they face. Some have side effects from therapy, concerns about their medical bills or fears of what will happen if the treatment stops working. 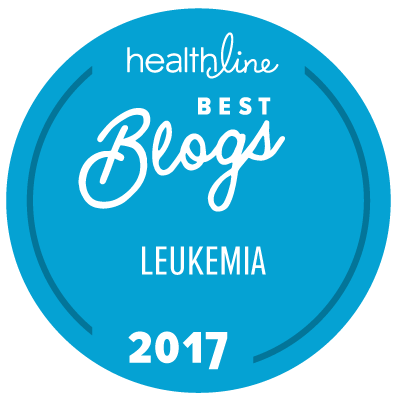 Some even feel marginalized by those with other cancers who express that they should feel “lucky.” And there is worry that we may imply that no more progress is needed in treating CML. We understand, and apologize. We’re making significant changes to our campaign. We encourage your constituents to revisit our website to see the changes we’ve made there. We’re focusing our message on those concepts that are more universally accepted: that we have revolutionized the treatment of CML with Gleevec® and turned a deadly cancer into one where life expectancy mirrors that of the general population. In making this decision, I share the following thoughts. I see patients every week in clinic who alert me to side effects they are experiencing. Many of these side effects can be addressed. For the majority of CML patients, with good medical management, individuals can not only survive, but have a good quality of life. I was concerned by the number of posts I saw that seemed to indicate otherwise. I urge patients to please talk to their medical providers about side-effects and other concerns so they can help. I also want to assure the community that my lab continues to work on CML in an effort to find better therapies and ultimately a way for all patients to safely stop treatment. I also encourage people to recognize that there are many different perspectives. Every person’s cancer journey is different. We need to embrace these perspectives. Those who feel cure is the right word for their experience should be as respectfully treated as those who do not. We want to be transparent that we plan on retaining our website and tagline, onedown.org. This idea is core to our goal of funding research. With Gleevec, we’ve created a life-saving treatment, and we want to discover more Gleevecs for more cancers. We want to move the conversation from cancer awareness to making cancer the victim. To do this, we must let people know that there has been a significant victory in that battle, regardless of the word one uses to describe it. We hope this is a position everyone can support. Director, OHSU Knight Cancer Institute"